I watched the Rolling Rally on NESN Saturday with pride and emotion as it wound its way along Boylston Street, over to the Common, then into the Charles (quite literally). Two million strong, Bostonians lined the streets, often forty deep; stood on steps, looked out windows; and, yes, gazed from roof tops, cheering wildly as their Red Sox heroes passed by in duck boats normally used for touring, waiving back, sometimes slapping hands. Duck boat diplomacy! Certainly, assuredly, unlike so much in life, everything conspired to make this day a success, not least, an unusually warm day in November Boston, a day that will replay itself in memory long after. Who would have thunk it: that last year’s record 97 losses and last place finish in the American League East would give way to World Series winners? This was a motley team in some ways stiched together remarkably, if not cunningly, by general manager Ben Cherington into a flamboyant weave that included a new skipper, John Farrell, articulate, knowledgeable, and able. Even then, it seemed a no go for the Sox as relief pitching woes mounted up what with sore arms and inability to put out fires. Ominously, ace pitcher Buchholtz, after a 9 and 0 start, developed a clavicle problem, removing him from the mound till September. Even in the Series, there was the bullpen collapse of normally reliable Breslow (the Yale biomed whiz). Chalk up their success to maybe the overachiever syndrome that sometimes compensates for handicap and wins through? Well, maybe. For sure, they didn’t get to the winner circle from any embedded superiority. You might even say this was a David vs. Goliath scenario, replaying itself nightly throughout the season and into the post season against all odds. The American League playoffs proved better than their hype, the Sox facing an always menacing Tampa Bay, followed by a heavy hitting Detroit team replete with two of the games superior hurlers. Finally, the perennial winning St. Louis Cardinals with, again, fine pitching and, on paper, a knock out bullpen. It didn’t matter. The clues, if you think about it, had a way of happening, and kept happening, from the very outset, with the Sox finding ways to win, coming from behind, usually in late innings; each game, a new hero: Big Pappi, Victorino, Gomes, Napoli, Nava; sometimes Ellsbury on the bases, setting the table; often, a leaping catch by an ever nimble Pedroia or Drew of a smash drive or a diving, in-the-web grab by Gomes. Slowly I began to believe. And so did Boston. They did it so often, thirty times, that it seemed a given–just wait. Hey, they scratched out one run wins, thrilled us nightly with walk off scenarios, and then there fell into place, as it were, our secret weapon, passionate, diminutive Koji Uehara, who hitters couldn’t hit. And how about Lester, fading, only to find himself again, winning games, and anchoring our rotation in the playoffs and Series? Not far behind, Lackey, back from Tommy John surgery, pitching gem after gem right through the Series. “A beautiful thing,” as colorful commentator Dennis Eckersley likes to say. So many stories here. So many heroes! Sadly, in this day of free agency and change as one of life’s non-negotiables, we’ll not see their like again with their bearded idiosyncrasies. Peavy ended up buying the duck boat on which he rode. (He had previously given us the cigar store Indian, which became a dugout fixture, home and away). Saturday evening, the celebration seemingly carried on, captured in a photo of Napoli, apparently inebriated, bare chested, wandering the streets. I doubt few Bostonians care. He earned his indulgence and drinks on the house. I do know we’ll miss that nightly tugging of the beards! Every now and then I come across some who disdain sports as a volatile vanity out-of-place in a troubled world. But I don’t see it that way. Here we can learn something from wise Vergil, who also knew the depth of suffering first hand. In one episode of his great Aeneas, he writes entirely of several sport contests. In his prescience, he knew their analogy with life. Sports give diversion, and what’s wrong with a time out anyway? But they are more than that, testing and teaching character, a word whose meaning we’ve largely lost to our own detriment. Tell me how athletes play the game and I’ll tell you if you can count on them in life. Their true value lies not in victory, but in pursuit. This was a team of bonded brothers who went everywhere together. They loved one another and how we loved them! 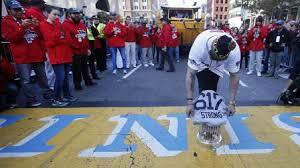 They helped Bostonians refocus. The poet Dante defined hell as a place of lost souls who had abandoned hope. The Red Sox taught Bostonians how to climb out of hell and hope again. Not least, a whole nation. How moving their stopping in Copley Square, the singing of God Bless America. Team and city united. City and team become one. What a wonderful day. What a beautiful thing. This entry was posted in Reflections and tagged Boston, Boston Red Sox, Boylston Street, Copley Square, Koji Uehara, RedSox, United States, World Series. Bookmark the permalink. Thinking of you, esteemed friend!